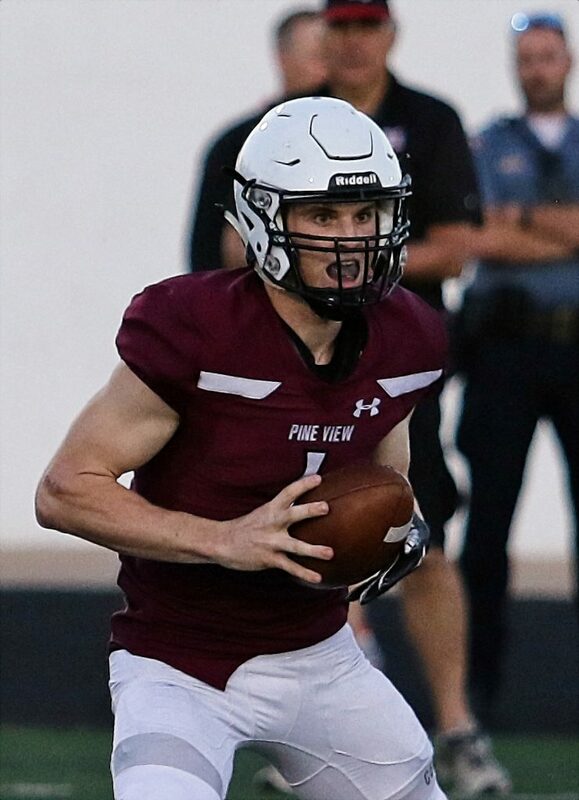 After being shut down last week offensively, Pine View responded with a resounding win on Thursday night, routing the Hurricane Tigers 77-13. Pine View started off fast when Dallin Brown fired a 55-yard touchdown pass to Izaiah Moten for a 7-0 lead. 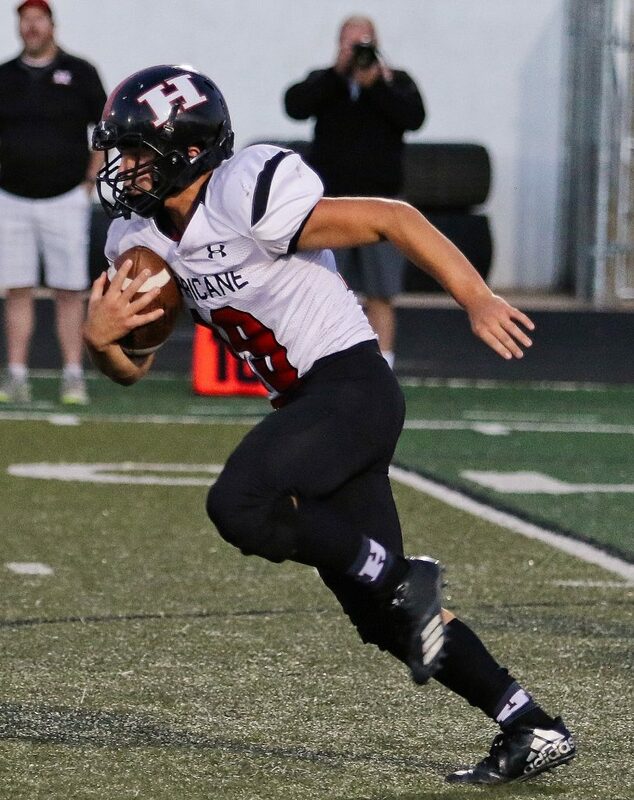 Things turned south for Hurricane on its first drive, when the Panthers’ Brooks Maile intercepted a pass and returned it 20 yards for a touchdown for a 14-0 lead at the nine-minute mark of the opening quarter. 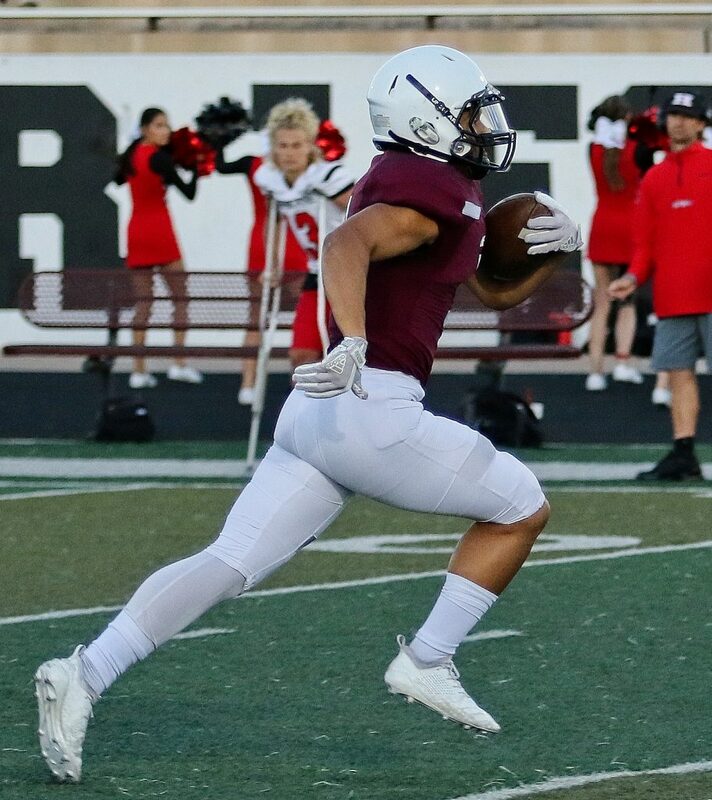 Pine View added two more scores in the next five minutes when Brown connected with Michael Moore from three yards out and Gibson Wright scored on a 7-yard touchdown run, giving the Panthers a 28-0 lead. 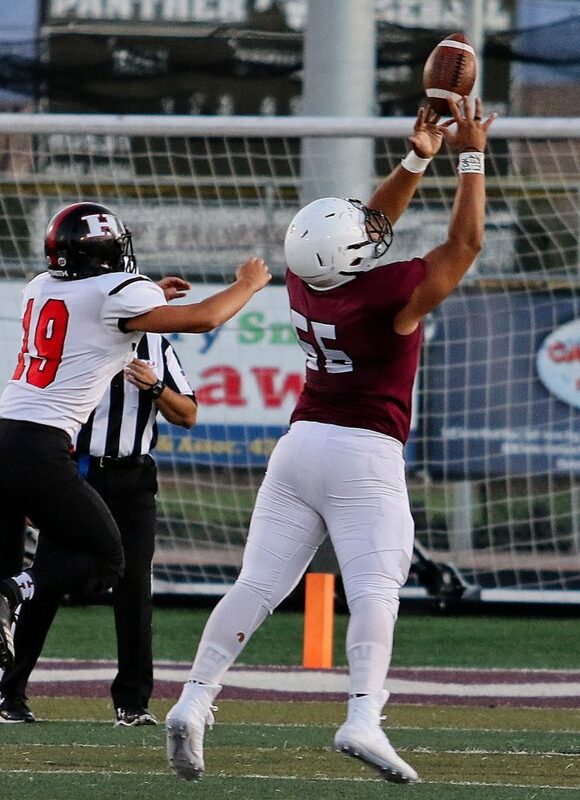 Pine View added another touchdown as time expired in the first quarter, courtesy of a 60-yard pass from Brown to Moore, making the score 35-0. The Panthers added another touchdown at the 9:38 mark of the second quarter, when Moore caught another touchdown from Brown for a 42-0 lead. Just four minutes later Brown fired yet another touchdown pass to Moore, a 19-yarder for a 49-0 lead. 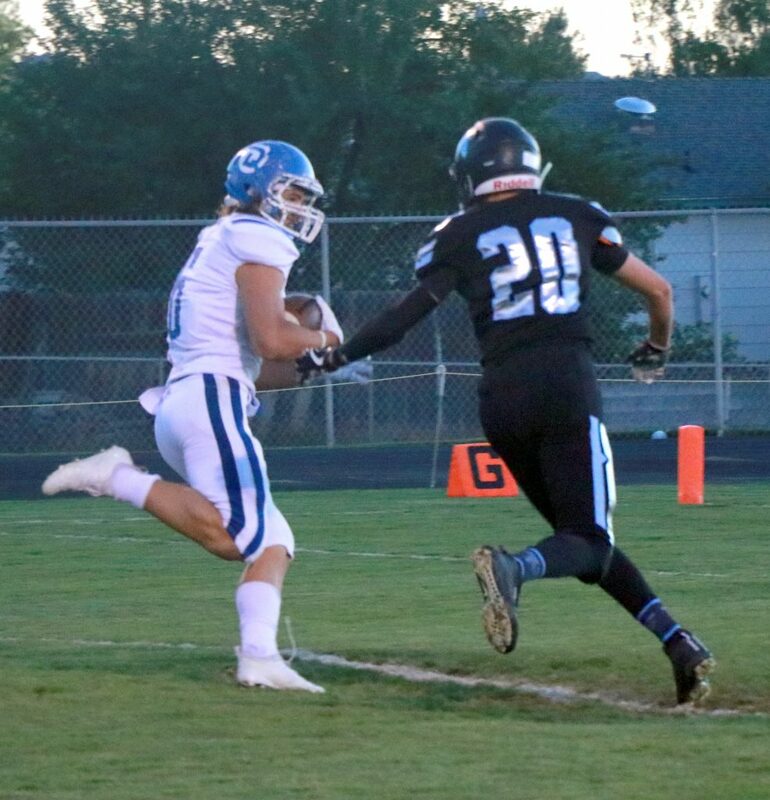 The Panthers added two more scores before the end of the half via a pair of Brown touchdown runs, including a 75-yard burst at the 2:09 mark to give Pine View a massive 63-0 lead going into halftime. The Panthers got on the board first in the second half when Wright scored from 17 yards out, making the score 70-0. 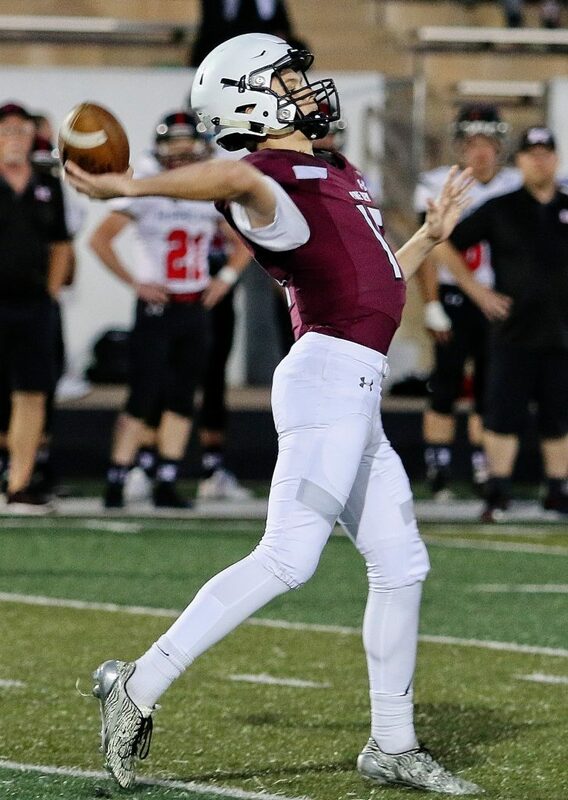 Hurricane finally got the goose egg off the scoreboard when quarterback Brock Starley connected with Ian Lambert on a 45-yard touchdown pass at the 3:41 point in the third quarter. Pine View and Hurricane both scored touchdowns in the fourth, making the final score 77-13. The Panthers offense had no problem scoring against the last place Tigers, as Brown accounted for seven touchdowns on his own (5 passing, 2 rushing). Wright added two touchdowns for Pine View on the ground. With the win, Pine View improves to 5-2 overall, 3-1 in Region 9 play. Hurricane drops to 0-7 overall, 0-4 in region. Hurricane will seek its first win of the season against first place Dixie on Wednesday at 7 p.m. The Panthers will travel to rival Desert Hills in a key Region 9 matchup on Wednesday. Kickoff is slated for 7 p.m.
At Cedar, the Snow Canyon Warriors broke open a tight game by outscoring the Redmen 17-0 in the fourth quarter to pick up a 24-7 victory. With just over seven minutes left in the fourth quarter, Cedar trailed 10-7 and had the ball on Snow Canyon’s 25-yard line. 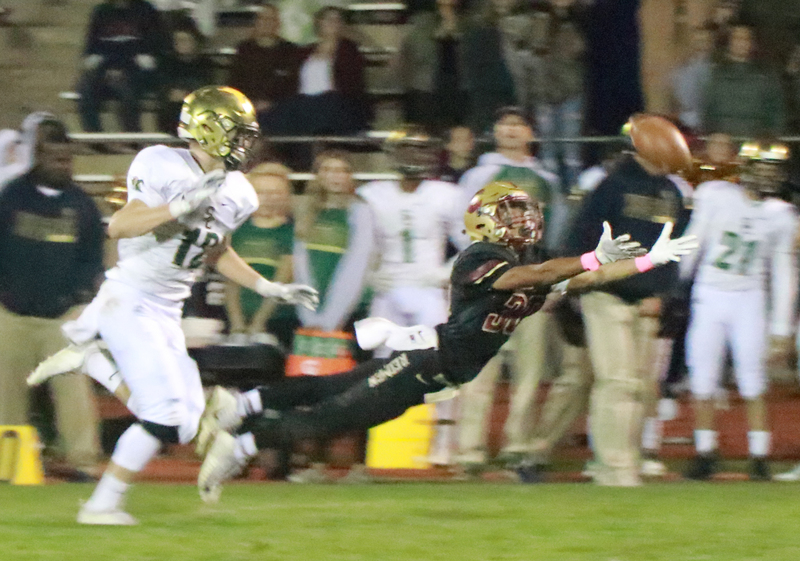 The Redmen opted to go for it on fourth down and 2 rather than try a field goal, as they had been unsuccessful on three previous attempts (one was negated by a penalty and two others missed). But on the ensuing play, Snow Canyon sophomore lineman Isaac Lees intercepted Cedar quarterback Jaxon Garrett’s pass and ran it back 75 yards for a touchdown. 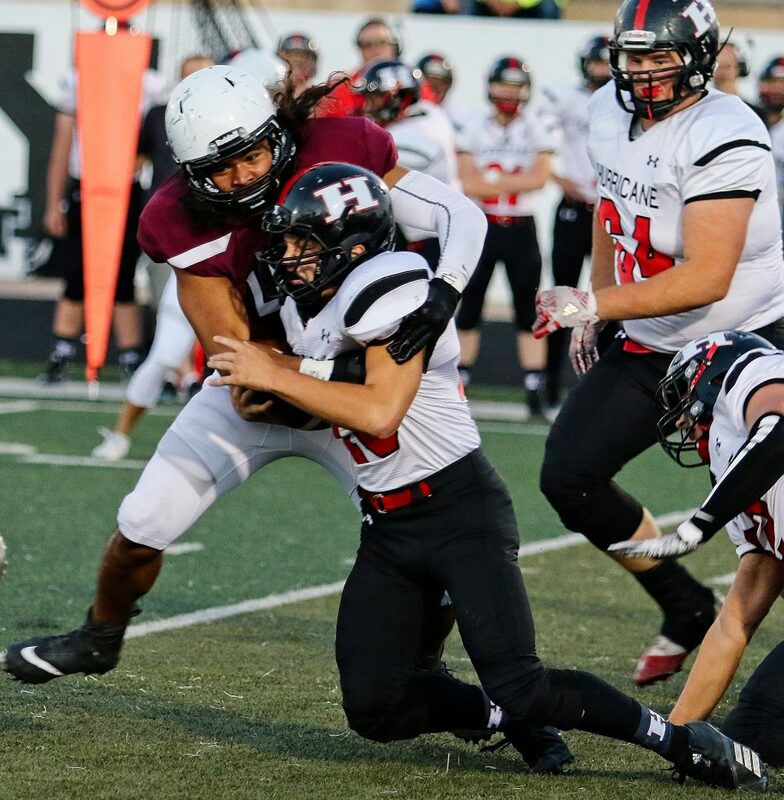 The dramatic score proved to be a backbreaker for Cedar, as the Redmen weren’t able to sustain an offensive drive, while the Warriors tacked on another rushing TD several minutes later to account for the final margin. Snow Canyon head coach Mike Esplin said right before Lees’ game-changing pick six, he and his fellow coaches were talking on the sideline about how the team could use a key turnover. Right after Lees made the play, Esplin said he first looked around to make sure no penalties had been called. The game had been a defensive battle for the first three quarters. The two teams traded TDs during the second quarter to account for the 7-7 halftime score. Snow Canyon’s Miles Reynolds found the end zone first on an 11-yard run, and Cedar’s Tayvien Brown answered shortly afterward by catching a 32-yard pass from Garrett. After a scoreless third quarter, the teams were still deadlocked until Snow Canyon kicker Matthew Van Gils kicked a short field goal early in the fourth quarter to put the Warriors up 10-7. 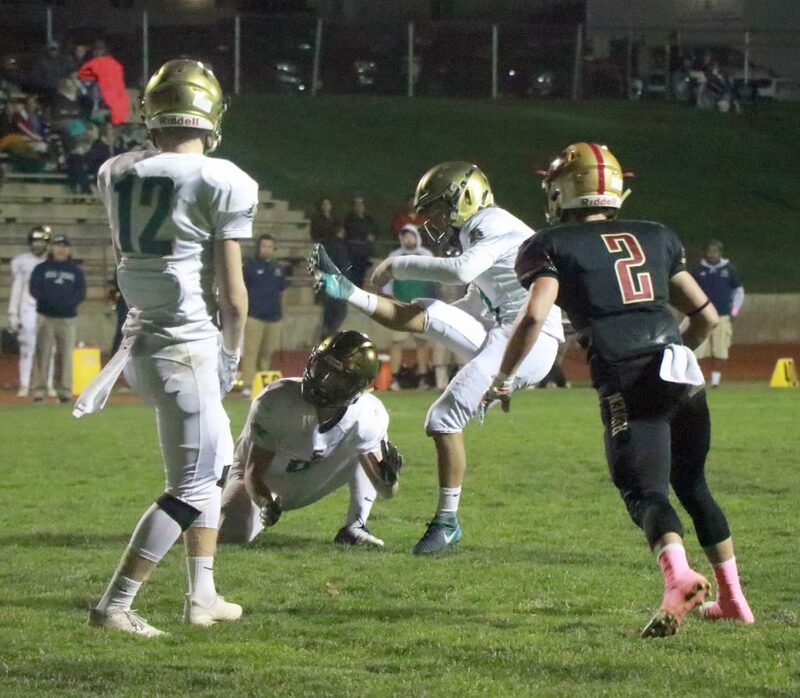 It was on Cedar’s next drive that Lees’ heroics turned the tide in favor of Snow Canyon. Snow Canyon improved to 1-3 in picking up its first region win. The Warriors host Canyon View on Wednesday. Cedar, which dropped to 1-4 in region play with the loss, has a bye next week before closing out the season at Pine View on Oct. 18. 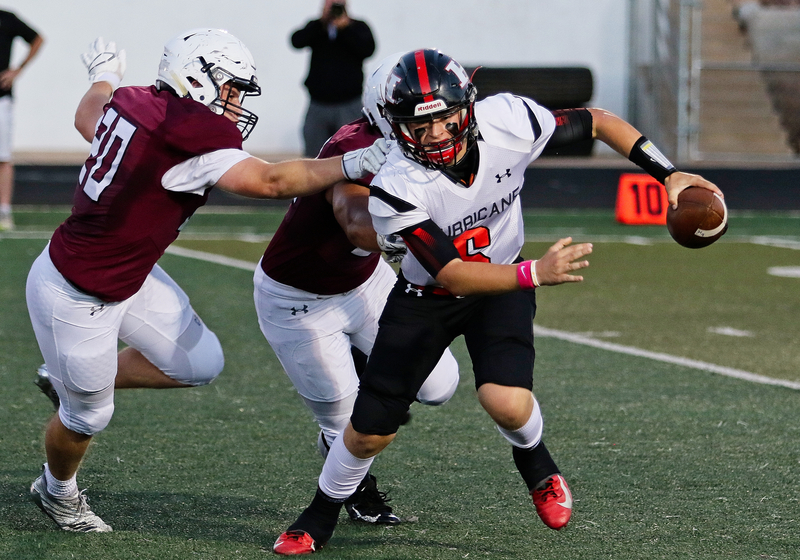 At Canyon View, the Dixie Flyers overcame a slow start to overwhelm the Falcons, 44-14. 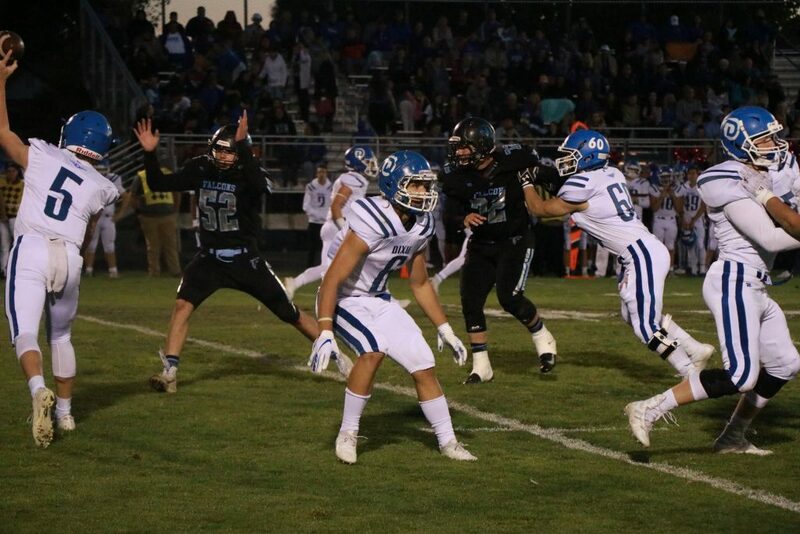 Five different players accounted for Dixie’s six touchdowns and kicker Josh Stewart added a field goal on top of going 5-for-6 on PAT attempts. Both teams punted on their first possession, but Dixie’s Tyson Miller scored a rushing TD from 1-yard out midway through the first quarter to give the Flyers an early 7-0 lead. In the second quarter, the Flyers scored four more TDs and added a field goal right before halftime to take a 37-7 lead. Canyon View’s only score of the first half came on a 29-yard TD pass from Colten Shumway to Brayden Cavaleri. Each team scored one more TD during the second half, with Dixie’s Preston Moore breaking loose for a 59-yard rushing score early in the third quarter and Canyon View’s Landon Yardley running one in with just over three minutes left in the fourth. With the win, Dixie improves to 4-0 in region play with two games left on their schedule. Next week, the Flyers travel to Hurricane to face the winless Tigers on Wednesday. Canyon View, which dropped to 2-3 in region play, will play at Snow Canyon next Wednesday for their final region game.